Values aren’t just words we believe in—they’re standards we live by as an organization. They guide our business, they make us strive to be better and they give us a cultural north star. In the last year, we at Sprout Social have grown exponentially as a workforce—we substantially grew our team and acquired Simply Measured, an industry leader in social analytics. It’s been pretty rapid change. Knowing how crucial it is for employees to recognize themselves in our company’s values, and understanding how much we’ve grown since our values were developed in 2010, the timing was right to give our values a refresh. Take a behind-the-scenes look at how the team tackled the project. From the outset, we knew the process of refreshing our values needed to be driven by the team at large. To incorporate a diverse set of perspectives, everyone needs to have a voice. We started the process by sending an open invitation to the entire team to participate, and we were blown away by the response. From employees who joined a few months ago to people who had been with Sprout since the beginning, our volunteers included individual contributors, managers and leaders from across the organization. To kick off our brainstorming, we identified a working group of about 15 members who led smaller, department-based focus groups with all of the participants from their teams. It was important to us that this process didn’t begin with our executive team making calls from the top down—instead, our employees led the charge by collaborating on ideals they find to be the most vital to what makes Sprout’s culture successful. With hundreds of ideas jotted down on post-its, there was a palpable excitement about everyone coming together to share their vision for the next evolution of Sprout’s values. Once we whittled down our ideas, we really started to get to the heart of what we stand for as an organization. Building off the momentum of the first phase, the working group took our learnings from the focus groups and continued the ideation process. We focused on identifying themes and discussing the future these values would lead Sprout toward. We weren’t solely focused on what everyone loves about our company; instead, we used this process to spark a broader conversation and constructively tackle the things we can do better. In this case, we discussed values that represented both our existing culture and our aspirations. Small Council includes our four founders as well as leaders who have joined Sprout more recently, and needless to say, they’re incredibly invested in our culture and team. After hearing from our values working group, they eagerly jumped into discussing and refining the themes—ultimately landing on seven core values. 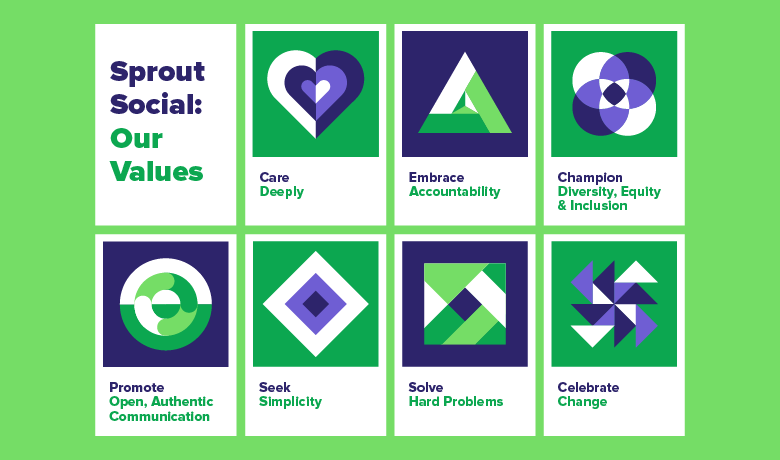 Without further ado, we’re excited to share our refreshed set of Sprout Social values. In a lot of ways, that process itself represents where we landed—solving hard problems, always opening up communication, championing diverse input and simply caring. This process wasn’t easy, but it was worth the time and the commitment of our people to get it right. Sprout’s story may see several iterations of these standards in the years to come, but as we continue to grow, so will our commitment. Maureen Calabrese: Maureen is the Chief People Officer at Sprout Social. Find her on twitter @mcalabrese312.